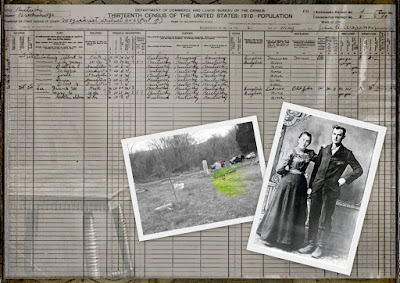 Today, one hundred and ten years ago, in 1902, my paternal great-grandparents, Albert 'Fritz' Tabeling (1870~1919) and Lillie Mae Pate (1879~1919), were married in Breckinridge Co., Kentucky. That flu epidemic was awful, so many lost. Your grandmother Ines was so young to have lost both parents. What rough times they lived through. What a lovely photo with her hand on his shoulder. Many people think cemeteries are morbid, but I love them, and when families are together, it's very comforting. Your Grand parents were a beautiful couple and so was your mother. They are celebrating together today. Gini...What a very interesting and informative post. Not only does it tell your ancestors story, but it gives us a glimpse into the history and circumstances at the time of their deaths. Knowing about the 1918-19 Pandemic Flu is a piece of information that may help with finding others ancestors. I have some unexplained deaths and lost ancestors from Georgia during these years. I hope you find Oletha, Viola and Josephine...love their names...my 2X great grandmother was Josephine...I have visited her grave...it was a moving experience. Her husband and a son are buried beside her in unmarked graves...I'm going to have markers made for them..one of my 2012 goals. Thanks for this wonderful post and for sharing your Kentucky Family! Thank you, Carol, Wendy, Betty and Sue, for visiting! The 1918-1919 flu really wiped out a lot of members in my family/Ancestors and in so many others . . . very sad time and one I have been learning more and more about. I am looking for my great Aunties to see where they ended up. I did find a newspaper article that a Tabeling uncle tried to take care of them but was accused of taking the families money. The accusation was false and he was cleared . . . that's another post! This is a beautiful story and a great idea for a collage. Thank you, Kathy, glad you stopped by. That's a terrific story. How wonderful that the family took them in! They were good people. I hope you learn more & post it. Thank you, Colleen, I do too . . . as I go along, I will be posting my findings! The Laslie's were very generous as well as my great aunt, Emma Robinson née Tabeling . . . I had found a census report about two years ago, but, I did not site my sources (bad Gini) and now need to retrieve that census again, showing which child resided with her. Thanks for stopping by.